As an integral part of your bedroom storage decor, you dresser should be an extension of your style and taste, while serving as the centerpiece to your morning routine. 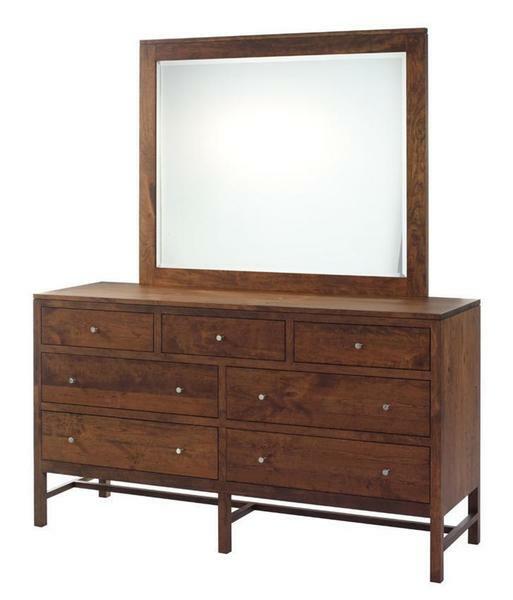 Taken from the pages of the classic Shaker style, with a touch of modern, rustic flair, our Lynnwood Dresser is sure to make just the right statement in your bedroom suite. Featuring seven full-extension, dovetailed drawers with large panel fronts, you'll be sure to have all the room you need for your clothes and delicate items, while displaying the true beauty that lines in the unique grain patterns of the American Hardwood. Add the under-mounted drawer slides to crate that one-of-a-kind floating drawer that offers a soft close mechanism to ensure your drawers will never slam closed again. Add our optional beveled edge mirror for a matching piece that will ensure you always look your best before heading out to face the day! The true beauty in hand-made Amish Furniture lies in your ability to select your favorite hardwood and stain combination and have your new dresser crafted just for you. From a quaint wood shop that lies in the heart of Ohio's Amish Country, to your bedroom. Let us help you craft the bedroom suite of your dreams! Thanks we received and its beautiful! !